Inside sales can be much more than telemarketing or a bunch of clerks taking orders, if that is what your inside sales team looks like you are leaving a lot of money on the table. 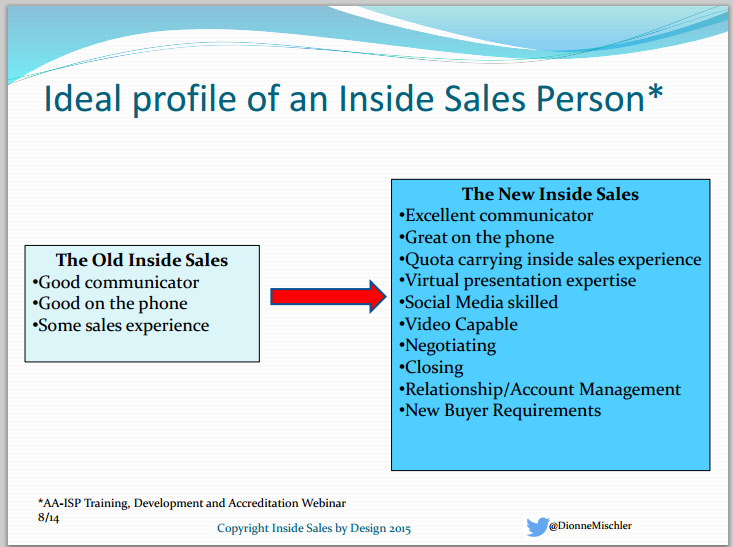 According to Dionne, the Sales World has changed. The days of the old model where Outside Sales brought in the big bucks and inside sales – customer service being a bunch of order takers is gone. 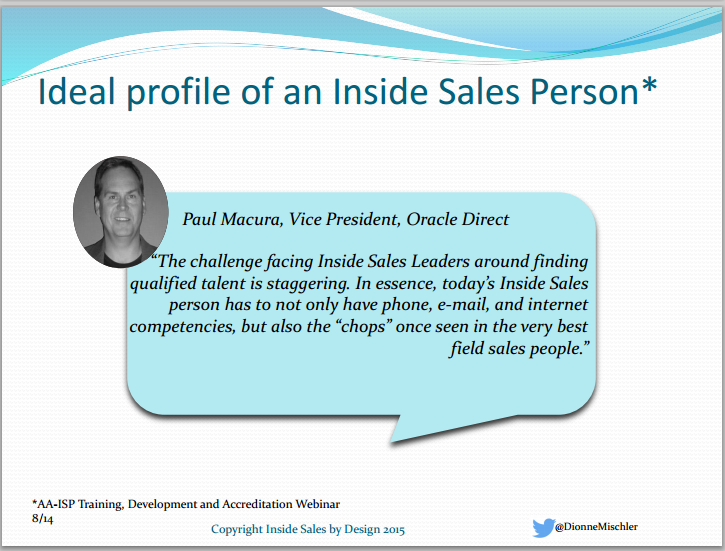 The high cost of outside sales people has driven a new model for Inside Sales Teams. In the new model inside sales make and closes the vast majority of the deals. She said that technology has changed the way Prospects – Customers buy. Information is available on line and they do their research up front long before they contact you or you contact them. We as sales & marketing folks have the ability to know much more about our target customer – prospect as well. Using tools like Salesforce CRM, Pardot, Marketo, Hubspot and many others we are able to know the message that will resonate with that specific prospect – customer’s typical needs. Grabbing a phone book or phone list and dialing for dollars is dead. Customers are much more at ease buying over the internet, by phone or via a combination of the two, think Skype, Go to meeting WebEx etc. They do not need or often want an outside sales person to take up their time with long presentations tying up a room full of executives. Not that Outside Sales is dead, the model moves more of the sales process on to the inside team and often it is the whole sales process. From prospecting the lead to the close and after the sale service. The cloud makes this possible think Salesforce CRM. Etc. Internet Marketing has become key to keeping your name top of mind with the prospect – customer. 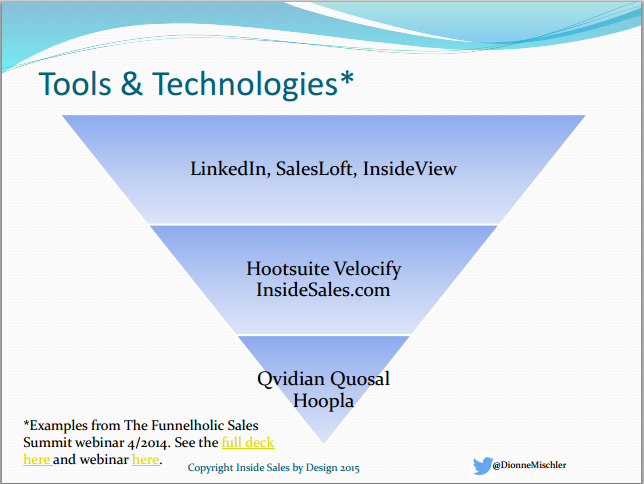 Inside Sales can test market on a daily or hourly basis to find out what resonates in specific market niches. This offers real time feedback that can be used to create messaging for a larger market audience and reduce the risk of using the wrong message. For a start up, goals are based on measurable activity. For and existing product – business it is based on Quotas in dollars. It was surprising to me that software licensing renewal deals of $1 million dollars are being done by inside sales. Dionne says these big deals are outliers at the moment, deals up to the $30,000 range are happening regularly with top notch inside sales teams. The role of Tech. In the past it took a year of more for an inside sales rep to learn the products in a B2B market. It took even more time for them to understand the customer’s needs well enough to make sure they not only got what they wanted but all the parts and pieces they needed. She gave a simple example in aerospace getting they wrong bolt could cause a plane crash. Knowing they right specs and then reminding the customers that they need a nut and a washer for each bolt took time. Now they ordering software can prompt the inside sales person to make sure it meets the specs and ask if they need washers and nuts to go with the bolts. Even a rookie inside sales person can make that sale. Inside sales reps are generating $500,000 to $1 Million in gross revenue a year. Salaries for top quality inside sales people have risen as well in to the $90 to $120, 000 range. The split is often 60% salary and 40% commission or 70% Salary and 30% commission. As in many things, you get what you pay for, if you want order takers then salaries of $50,000 or so won’t get much revenue generation. Articulate and can turn a prospect into a customer with intelligent questions. Calls with confidence & competence and open to learning it. 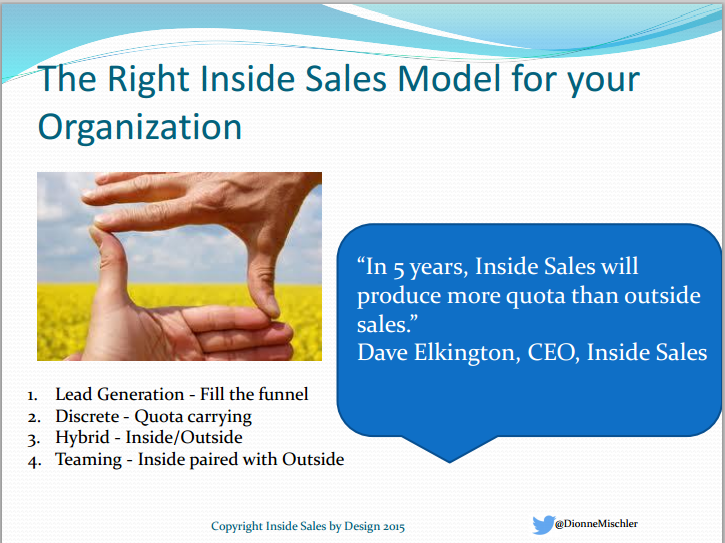 The new model of the inside sales team as a profit center has taken hold. It is fast becoming the norm in high tech companies in Silicon Valley. As the model proves out it will be adopted by other industries. The companies that adopt this model will have a significant advantage over those who sink money into teams that only take orders. This entry was posted in Product Manager Orange County and tagged inside Sales, Phil Sallaway, Sales, Salesforce, Salesforcemaven. Bookmark the permalink.